The Plantaris muscle is a small muscle with a short belly and long slender tendon that is located at the posterior compartment of the leg and along with the Gastrocnemius and Soleus muscles, forms the Triceps Surae. The long, thin tendon of plantaris is nicknamed the freshman's nerve, as it is often mistaken for a nerve by first-year medical students during dissection. This muscle is believed to be an accessory muscle and only vestigial in humans, and that it might be absent in 7 to 20% of individuals. It originates from the lower part of the lateral supracondylar line of the femur and from the oblique popliteal ligament of the knee joint and the muscle belly crosses the popliteal fossa inferomedially. In the proximal third of the leg, the muscle belly is situated between the popliteus muscle anteriorly and the lateral head of the gastrocnemius muscle posteriorly. Its long slender tendon courses distally between the medial head of the gastrocnemius muscle and the soleus muscle in the middle third of the leg. The muscle inserts medially, in association with the Achilles tendon on the calcaneus, or independently on calcaneus. Neural innervation of the plantaris muscle is provided by the tibial nerve (S1, S2). Blood supply to the plantaris muscle is from the popliteal artery. In terms of function, the plantaris muscle acts with the gastrocnemius but is insignificant as either a flexor of the knee, or a plantar flexor of the ankle. It has been considered to be an organ of proprioceptive function for the larger, more powerful plantar flexors, as it contains a high density of muscle spindles. 1. The plantaris muscle is not a prime mover and does not have a primary action but assists with the actions of other muscles at the knee and ankle joints. Even though it is a largely unremarkable muscle, the plantaris tendon is clinically significant because of its potential use as a graft due to its length and tensile strength. Removal of the plantaris muscle does not typically hinder the patient’s lower extremity function in the presence of a normal soleus and gastrocnemius. Also, pathology of the plantaris muscle and tendon is an important differential diagnosis for calf strains and any pain arising from the proximal posterior aspect of the leg. Palpation of the muscle belly is possible in the popliteal fossa as well as along the medial aspect of the common tendon of the triceps surae group. With the patient prone and the leg flexed to approximately 90 degrees, the distal hand of the practitioner covers the heel while the forearm is applied against the plantar aspect of the foot, allowing a simultaneous resistance to plantarflexion of the foot and flexion of the knee. 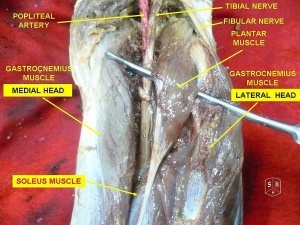 The muscle is palpated in the popliteal fossa, medial and superior to the lateral head of the gastrocnemius muscle. ↑ Simpson SL, Hertzog MS, Barja RH. The plantaris tendon graft: an ultrasound study. The Journal of hand surgery. 1991 Jul 1;16(4):708-11. ↑ 3.0 3.1 Sharma S, Khullar M, Bhardwaj S. Unilateral Accessory Plantaris Muscle: A Rare Anatomical Variation with Clinical Implications. Global Journal of medical research. 2015 Jan 21. ↑ Spina AA. The plantaris muscle: anatomy, injury, imaging, and treatment. The Journal of the Canadian Chiropractic Association. 2007 Jul;51(3):158.